We live, work, and play in Aldergrove and support our community. Friday April 19th (Good Friday) Diamond Bar Equipment will be closed until Tuesday April 23rd. We wish you all a safe and fun Easter weekend, and apologies for any inconvenience this may cause. Management of Diamond Bar Equipment. For lawn tractors, walking mowers, leaf blowers, pressure washers, chainsaws, sprayers, trimmers and much more, we are your one-stop garden and lawn equipment supplier. We make sure you’ve got what you need and that you understand what you’ve got, and when it needs service or maintenance, bring it right on in to us. One thing that sets us apart: we service what we sell. Like cars, small engines need regular maintenance and care to run their best and keep your property at its best. 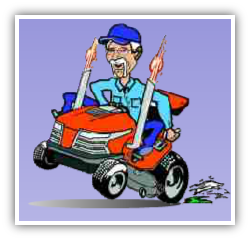 Let our friendly service technicians take care of your maintenance needs. The name Diamond Bar Equipment comes from a branding iron, “Diamond Bar,” originally owned by store owner Bruce Heslop’s grandfather, Tom Heslop, who came to North America from England in the 1800s. He made his way across the U.S. and eventually ended up cattle ranching in the Nicola Valley. He was also a butcher and owned a trucking company that worked between Kamloops and Merritt. The brand was handed down to Bruce’s father, C. Harold Heslop, who ranched in Kamloops. He was a cowboy for many years and became a welder and mechanic when his children came along. The brand was handed down to Bruce because of his interest in animals and horses. The brand is still registered, after all these years. We love the brand and the name so much that we named the company after it. We have the original forged iron still hanging in the store.